Tue., Aug. 28, 2018, 10:58 p.m.
Pinch-running pitcher Vince Velasquez was called out for leaving second base early while tagging up, resulting in a game-ending double play that gave the Washington Nationals a 5-4 win over the Philadelphia Phillies on Tuesday in Philadelphia. Anthony Rendon hit a go-ahead, two-run homer off Pat Neshek (1-1) in the Nationals ninth. 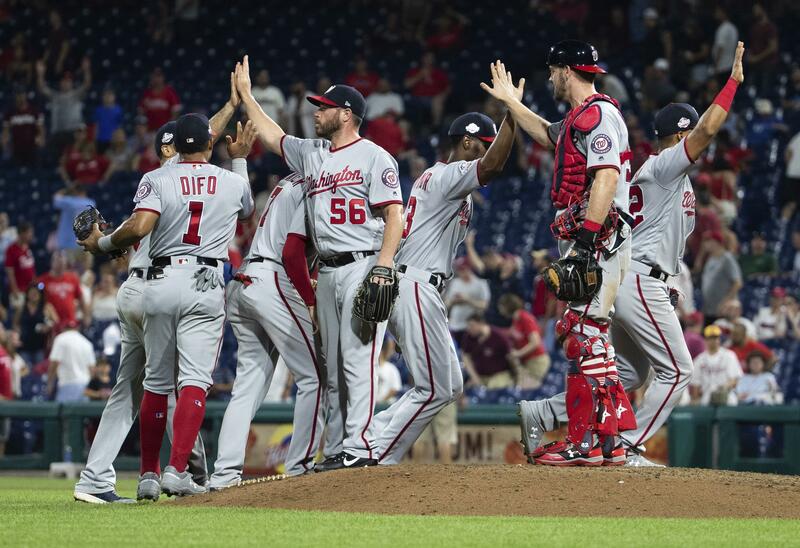 The Nationals trailed 3-2 when Bryce Harper drew a leadoff walk from Tommy Hunter. Neshek surrendered Rendon’s 17th homer, and Washington added another run on an error after Ryan Zimmerman hit his third double of the game. RED SOX 8, MARLINS 7: At Boston, J.D. Martinez scored when Marlins shortstop JT Riddle threw away a potential double-play ball in the ninth inning, lifting the Boston Red Sox over Miami following a wild, back-and-forth final two innings. Boston snapped a three-game skid and avoided its first four-game losing streak of the season – barely. ATHLETICS 4, ASTROS 3: At Houston, Nick Martini hit a tiebreaking double in the ninth inning and the Athletics defeated Houston, snapping the Astros’ six-game winning streak. The A’s moved within 1 1/2 games of the AL West-leading Astros. Alex Bregman’s two-out, two-run double in the Houston fifth off Edwin Jackson made it 3-all. BRAVES 9, RAYS 5: At Atlanta, Pinch-runner Adam Duvall scored the tiebreaking run on a delayed dash from third base in Atlanta’s four-run eighth inning, and the Braves beat Tampa Bay to snap the Rays’ eight-game winning streak. Chaz Roe (1-3) walked Kurt Suzuki to open the eighth. Suzuki advanced to third on Ozzie Albies’ third hit, a double to the right-field corner. Duvall, running for Suzuki, initially remained at third base on Dansby Swanson’s groundout to second. When first baseman Jake Bauers looked to possibly throw to second, where Albies was standing off the bag, Duvall took off in a desperate sprint for the plate. Home plate umpire Chad Fairchild called Duvall safe on his slide under the tag of catcher Michael Perez, beating Bauers’ throw to the plate. A video review lasting 1 minute, 45 seconds, confirmed the call. Pinch-hitter Tyler Flowers, who agreed to a contract extension earlier in the day, followed with a two-run homer that landed in the Rays’ bullpen behind the left-field wall. Ender Inciarte, who drove in two runs on four hits, added another homer to center off Andrew Kittredge. Brad Brach (2-3) recorded the final out in the eighth. The Rays loaded the bases off A.J. Minter with two outs in the ninth. Willy Adames’ groundout ended the game, and first-place Atlanta moved 4 1/2 games ahead of Philadelphia in the NL East. YANKEES 5, WHITE SOX 4: At New York, Pinch-hitter Neil Walker connected for a solo home run in the bottom of the ninth inning, and the New York Yankees rallied from a four-run deficit to defeat the Chicago White Sox. Aaron Hicks hit a tying homer in the eighth and rookie Miguel Andujar also had a two-run shot to help the injury-depleted Yankees win for the ninth time in 11 games. With the second-best record in the majors, they began the night 6 1/2 games behind first-place Boston in the AL East. ORIOLES 12, BLUE JAYS 5: At Baltimore, Josh Rogers won his major league debut, Tim Beckham hit a three-run homer and the Orioles rolled over the Blue Jays. INDIANS 8, TWINS 1: At Cleveland, Carlos Carrasco struck out 11 and withstood another scary Minnesota line drive, pitching the Indians past the Twins. ROYALS 6, TIGERS 2: At Kansas City, Missouri, Jakob Junis held scuffling Detroit to six hits in his first career complete game, Adalberto Mondesi homered to spur a five-run frame and the Royals beat the Tigers. The only runs Junis (7-12) allowed came in the third, when Jeimer Candelario managed a sacrifice fly, and the eighth, when JaCoby Jones went deep. Otherwise, the Royals’ young right-hander was brisk and efficient, striking out seven without a walk to win for only the second time since May 18. REDS 9, BREWERS 7: At Cincinnati, Jose Peraza started Junior Guerra’s rough outing with a two-run homer, and the Cincinnati Reds withstood Christian Yelich’s first multihomer game. Peraza homered and Guerra let in another run with a wild pitch during a nine-batter first inning. Guerra left with the bases loaded and one out in the second. He hasn’t won since July 8, going 0-4 in his last eight starts. Guerra has pitched four innings or less in half of those games. DODGERS 8, RANGERS 4: At Arlington, Texas, Manny Machado drove in four runs, Brian Dozier hit his 20th homer of the season and the Los Angeles Dodgers beat the Rangers for their fourth win in a row. CARDINALS 5, PIRATES 2: At St. Louis, Jose Martinez and Tyler O’Neill homered, rookie Jack Flaherty pitched seven innings and the Cardinals beat the Pirates in Mike Shildt’s first game since being promoted to full-time manager. ROCKIES 3, ANGELS 2: At Anaheim, California, Carlos Gonzalez hit a two-run homer in the first inning and the Rockies beat the Angels to split their series. Noe Ramirez (4-5) became the first player in Angels’ history to earn a save one day and start the next day’s game. PADRES 2, MARINERS 1: At San Diego, Travis Jankowski homered on Felix Hernandez’s first pitch and rookie Jacob Nix came within two outs of a complete game in his fourth big league start for the Padres, who beat the Mariners. GIANTS 1, DIAMONDBACKS 0: At San Francisco, Pinch-hitter Gorkys Hernandez singled home the winning run with one out in the ninth inning, lifting the Giants to a win against the Diamondbacks. Steven Duggar scored the deciding run moments after what looked like a potentially serious injury. Duggar stayed in the game after making a headfirst slide back into second on Nick Hundley’s single after he initially rounded second. Duggar was seen testing his bruised left shoulder, which will be re-evaluated Wednesday. Arizona fell into a first-place tie with Colorado atop the NL West. Going back to Sunday’s 5-2 win against Seattle, the Diamondbacks have gone 23 innings without scoring – shut out by the Giants for a second straight game and for the seventh time in all this year. Published: Aug. 28, 2018, 10:58 p.m.